Welcome to our website, through this we hope to share with you some of the wonderful memories created over the past 42 years of our involvement in the wonderful world of purebred dogs. Barrie grew up in England, an only child who had all manner of pets form the local pet shop to keep him company ranging from guinea pigs to a Sealyham terrier – while Jean grew up on a dairy farm in northern Tasmania and along with the farm animals had a special cat that she snuck into bed with her each night. Her mum often tells the story of putting the cat out only to check the room later and find the cat back in on the bed. This continued for some weeks before it was found that Jean was opening the window after she had been put to bed and calling the cat in. At the time of their marriage in 1973 Barrie was posted to Papua New Guinea with the Army and by the time Jean arrived 4 weeks later they were already a family of 3. Barrie had been to the RSPCA and bought a little Boxer cross puppy named Princess as a welcome present. It took a whole 2 days before they were back at the RSPCA taking home Princess’s mum Honey a pure bred boxer. As their time to leave PNG grew near they knew that they could not bring Princess and Honey home with them and so found a family willing to take the 2 of them on. They also decided that they wanted another dog when they got back to Australia so the hunt began. It was narrowed down to 2 breeds – Barrie wanted an OES as he remembered them from his childhood in England and Jean wanted an Irish Setter as the family doctor had one called Rufus which he would bring with him when making house calls. Jean was also rather taken with breed of dog called Puli which she had seen in the National Dog Annual. So it came that on their return they had contacted Grace Barlow of the Movama (OES) kennels in Sydney and Birkenmoor (Irish setter) kennels in Victoria and Birkenmoor Piplika (Piplika) greeted them on their arrival in Melbourne in September 2005, she was joined in early 2006 by Movama Blue Beauty (Delilah). Grace had convinced them to try showing to help them meet new people outside the army circle. We are very grateful to Grace for this as over the years we have made some wonderful friends in the dog world and ventured to some amazing places. Very early in our show career we met Rex & Ros Lowe & their Irish setters, Annette & John Green of Talwaha Boston Terriers, Richard Watson Kerry Blue Terrier and his late father Jim Watson Cairn Terriers, Heather Collet (OES & TT) and Kaye Klap (Labrador) who all has remained good friends over the years. So to today... Jean finally got her Puli in 1982. Hobo was her shadow for almost 17 years Hobo was from Herta Buxey's Abdyilla kennels in Vic and then in 2002 Ms Xena came into our lives from Margaret Keil Pastor Kennels Vic. In August 2013 Gypsy arrived from Rustufarian Kennels in Sydney. She is a live wire and has affectionately become known as the little black bear in our show circle. 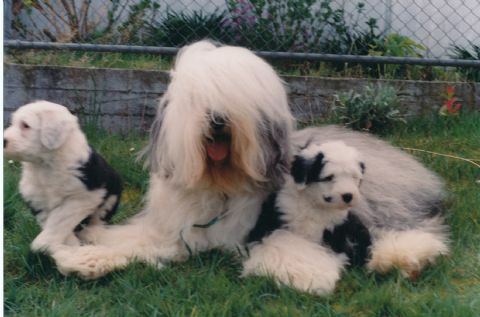 We added a Tibetan terrier to the family in 1989 and currently have Kammy’s great grandson with us. Along the way we have also had our wonderful Winston (British Blue) and thenMs Blu (short haired exotic) and now Pirate Domestic Shorthair completes the family. We have bred 15 OES and 3 TT champions to date , the lastest litter of TT's were a joint venture with our good friend Heather Collet and so where bred under the Rogspa prefix. This litter has produced 4 champions.